Much has been written about the legend that is Stuart Smith – the first true Superstar of Stock Car Racing. His achievements are well documented, but bear repeating: thirteen consecutive points titles, two seasons with at least fifty final victories, a grand total of 500 final wins, six World Championships including three consecutive victories, three times British Champion, three times European Champion. There were also successes overseas, in Holland, New Zealand and South Africa. He was, simply, an outstanding talent and could dominate race meetings to the point that his presence would often reduce the races to a fight for second place. Along with running mate Doug Cronshaw (396), Stuart learned his trade in some basic machinery, before purchasing the Albert ‘Tiger’ Griffin car, with its Wildcat Buick engine, and it was his mastery of this projectile that was to be the making of Stuart. Once he had built a longer – and better handling – version of the Griffin car, for the 1969 season, he finally had the machinery to match his talent and he swept all before him, running away to the points and World Championship double. As the 1970s unfolded, Stuart kept on winning, right on into the 1980s, before he reined in his participation and concentrated on World Championships. As well as being an outstanding driver, Stuart was also an innovator, being the first to bring a race-prepared 427 V8 Chevy into the sport, the first to sport a ‘proper’ functional wing atop his roof, not to mention introducing offset axles and adjustable – tuneable – suspension components. Throughout his racing career, he strove for constant improvement to keep one step ahead of the field. He had one other string to his bow however – and one that arguably caused more heated debate than any of his on-track actions: he was a true showman. He accepted the cheers and played up to the jeers; those that already loved him loved him more and those that already hated him grew outraged to levels of near-hysteria. Who can forget his multi-coloured overalls; mock punch-ups on the track; provocative announcements over the PA? Always with tongue-in-cheek; always gaining the desired effect. 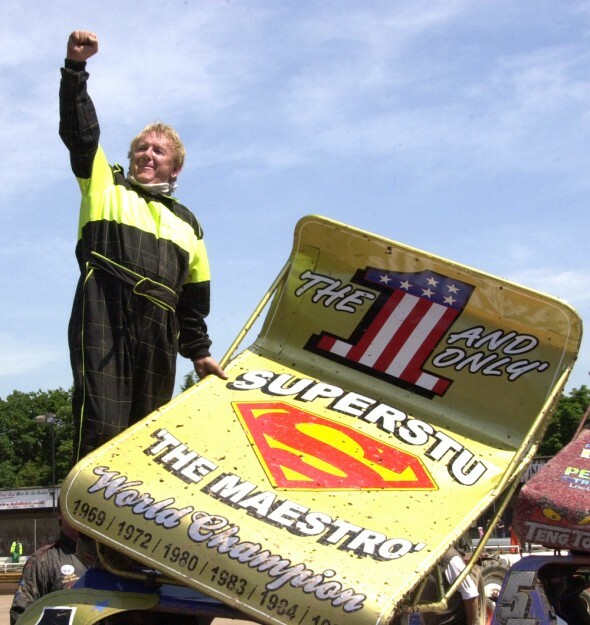 Sadly, the Maestro left us at the end of 2010 but he will always be remembered in the hearts and minds of all stockcar fans as being the greatest F1 stock car driver that the sport has ever seen. Further Photographs of Stuart Smith can be found on Brian Watson’s excellent website Ovalaction.com – Click HERE to be taken direct to Stuart Smith’s page. Final wins courtesy of official BSCDA historian Nigel Anderson.